Geologists have turned a series of 200 million-year-old lake-bed sediments into an epic narrative of the dinosaurs’ journey from ecological obscurity to Earthly supremacy, a mystery that has lingered even as their disappearance is explained. 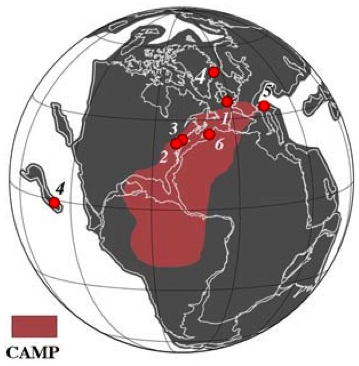 The dino path to dominance appears to have been cleared when the supercontinent Pangea cracked, setting off 600,000 years of volcanic activity that wiped out the dinosaurs’ crocodilian competitors. “This is the strongest case for a volcanic cause of a mass extinction event to date,” wrote geoscientists in a paper published March 22 in the Proceedings of the National Academy of Sciences. From 250 million to 200 million years ago, dinosaurs were just upstart lizards. 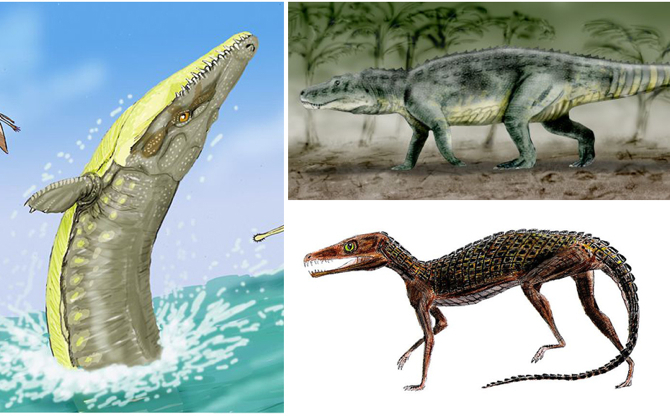 The planet was dominated by a family of vaguely crocodile-like animals called crurotarsans that filled every major ecological niche, from slow-munching herbivores to fleet predators. About halfway through that period, known as the Triassic, an asteroid struck Earth. Many of the planet’s species went extinct, but the crurotarsans weathered the storm. Then, 25 million years after that, in what’s known as the Triassic-Jurassic extinction event, the crurotarsans and at least half of all other animal species vanished. Exactly why isn’t known, but scientists now have a pretty good idea. Geological records show that Pangea, the giant land mass that once contained the seven modern continents, broke up about 200 million years ago. The North American plate and the African plate drifted apart, leaving a fissured basin that eventually became the Atlantic Ocean. Magma spurted through the cracks, forming a 3.5 million-square-mile lake of lava called the Central Atlantic magmatic province (marked in pink on the map below). In a paper published in 2007, Brown University geologist Jessica Whitesides, co-author of the new study, showed that the Atlantic basin stayed volcanic for 610,000 years, plenty long enough to shroud the planet in greenhouse gases. The new study backs up that explanation. The researchers analyzed sediment layers at sites in New Jersey, Connecticut and England, where lakes had been swallowed by lava at different times after the break up of Pangea. The sediments contained fossil pollen. Each grain had a telltale carbon atom signature, allowing them to put the samples in chronological order. Pollen records were then cross-referenced with footprints left in the lake beds by dinosaurs and crurotarsans. A clear picture emerged. As the volcanism continued, floral species vanished. By the end of the volcanic period, half were gone. So were almost all crurotarsans. As their footprints vanished, those of the dinosaurs grew larger and more frequent. They were taking over. For the next 135 million years, the great lizards ruled Earth. Then an asteroid struck the Yucatan Peninsula. Just as the crurotarsans had given way to the dinosaurs, the dinosaurs gave way to the latest upstart animal: a class of hairy, warm-blooded creatures called mammals.